There have been many different special-edition Raptors released over the years, including this yellow and black 60th anniversary edition. 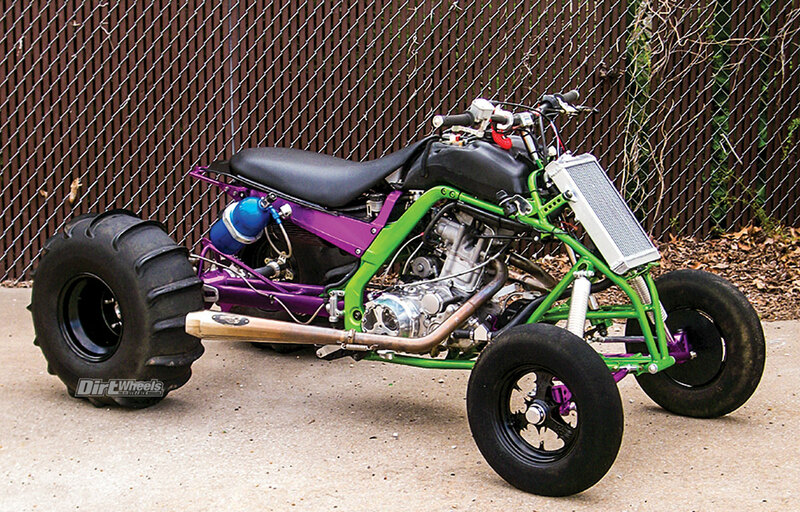 The 1990s maintained a stagnant state of limbo for ATV manufacturers of sport quads. Of the potential manufacturers, Yamaha was the strongest player with the famed Banshee 350 and Blaster 200 two-strokes and the Warrior 350 four-stroke. Yamaha had a strong hold on the market, but it also knew that those beloved two-strokes would slowly be forced from the line-up by increasingly strict emissions standards. The fight to stay ahead of the competition lit a fire beneath the Japanese mega manufacturer’s feet. The legendary two-stroke Yamaha Banshee had to be replaced with new technology—a machine that was more powerful with better handling. The first big-bore sport quad of its kind was born, our beloved torque monster, the 2001 Raptor 660. Nearing the end of the two-stroke revolution, the age of potent four-stroke powerplants arrived. Soon enough, Kawasaki was hot on Yamaha’s heels with its release of the KFX700 in 2004. Honda took a little longer to breech the 700 class with the 2008 TRX700XX that had rear independent suspension. 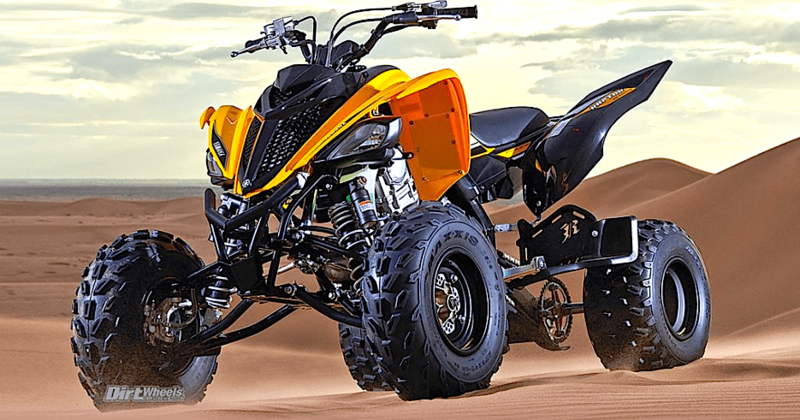 However, just like the Can-Am DS650 that was released in 2000, none of these machines could match the sales, performance and acceptance of the Raptor. 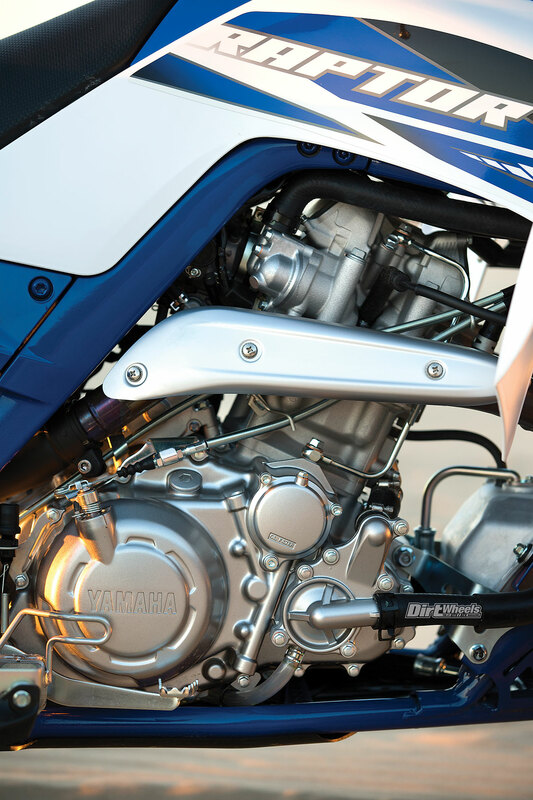 In 2015 Yamaha changed to a higher-compression piston and updated the cylinder to allow for a single header pipe to be utilized. 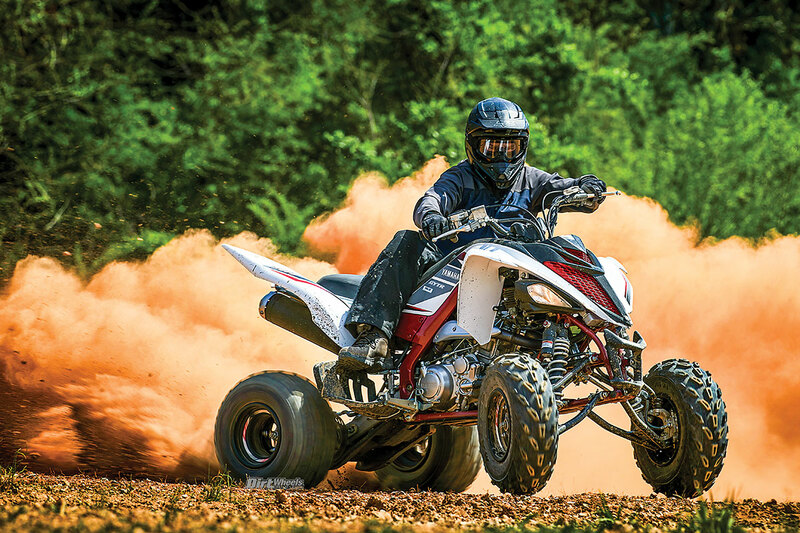 Honda provided the spark that ignited Yamaha’s thirst to build the Raptor—a machine that some called the sport quad king. The 1999 Honda TRX400EX came out 10 years after the TRX250R two-stroke faded out of the market. That machine, derived from the ultra-popular Honda XR400R trail bike, brought new life to the industry with its instant success. Racers had been building custom sport quads utilizing engines from four-stroke dirt bikes. Here was Honda making a machine that provided the durability and smooth, torquey power of a four-stroke that you could get at a dealer. Yamaha couldn’t let Honda steal the leadership it had held for so long, thus they assembled its best design team to begin creating the Raptor. First, the team needed an engine. 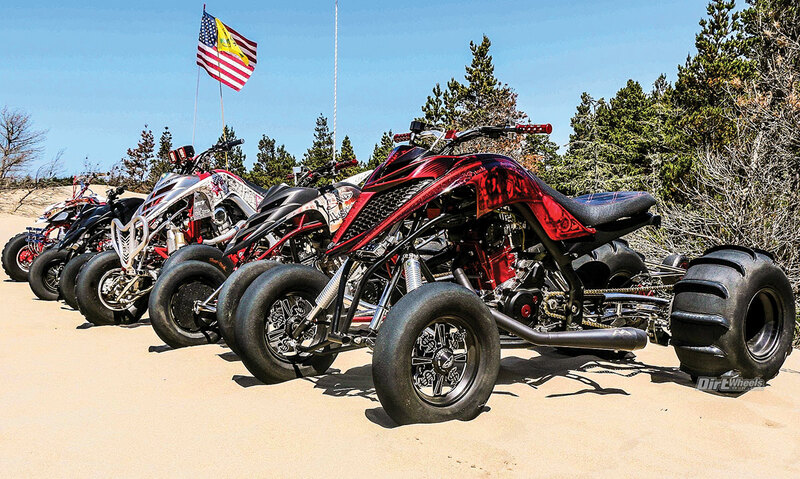 While they had a few to choose from, only one of the engines in other Yamaha ATVs and motorcycles provided the power and technology that the company wanted to implement into what they believed would be a market-changing machine. Yamaha picked a motor from a dual-sport-style motorcycle that most of us have never even heard of, the MZ Baghira. MZ was an East German manufacturer that was instrumental in the early design of two-stroke engines, but once the Soviet Union met its demise, they had to join forces with Yamaha to survive. The Baghira engine was packed with technology that made it powerful, reliable and easy to work on. The 660cc engine had four valves, a bore and stroke of 100mm x 84mm, was liquid-cooled and had a single-overhead camshaft. A five-speed manual transmission was paired to it, except a reverse gear was added to it, which the Baghira didn’t have. Dual Mikuni 33mm carburetors were used due to the two intake valves, which allows a better flow of fuel and air than a single large carburetor could provide. The size of the engine made it tricky to design a frame for the Raptor. Yamaha had to rotate the motor forward by redesigning the cases to get it to fit snuggly in the frame. That same lack of space meant that the radiator of the big bore had to be placed higher on the front of the frame right below the handlebars. Finally, Yamaha had to strengthen the clutch so it could handle the extra weight and traction load of the axle and second rear wheel of the Raptor. The Banshee 350 has been a favorite choice of ATV riders since its inception in the late ’80s, but one thing was always certain about the machine—it never handled well enough for the power of the engine. Turning the Banshee wasn’t the easiest, either. Yamaha took those facts to the drawing board and made sure that the Raptor 660 outmaneuvered the Banshee since the engine was already going to be more powerful. The front end produced 9.1 inches of wheel travel out of the front dual-A-arm design with 8.7 inches of travel from the rear swingarm. 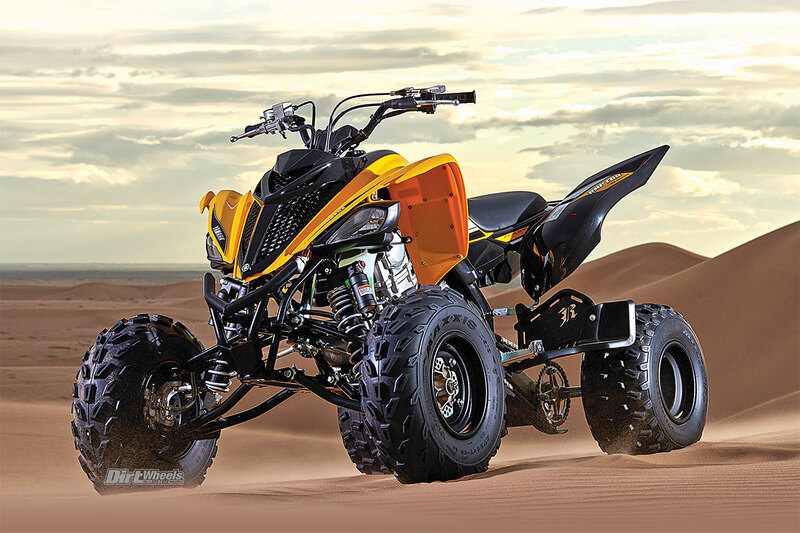 While the suspension numbers were equivalent to the Banshee, the updated frame and suspension geometry of the Raptor helped it turn easier and better than its two-stroke counterpart. After a few years on the market, the Yamaha Raptor 660 was a hit with consumers, but Kawasaki and Can-Am tried to steal market share. Yamaha began updating the Raptor, and a new model was born. The Raptor 700 is the best-selling sport quad today. The 2018 Special Edition model was recently released and it looks awesome. The Raptor 700 was the next step in the evolution of the 660, and it was released to an eager public as a 2006 model. The engine was redesigned with a larger-bore aluminum cylinder for 686cc to provide more torque, electronic fuel injection was implemented through a single throttle body and the bodywork was upgraded over the previous sport quad king. Yamaha continued on to make a new frame that had a steel undercarriage with aluminum spars and an aluminum subframe. The suspension was also updated with better geometry that allowed the machine to gain more shock travel in the rear. Ultimately, that gave the Raptor 700 better handling characteristics, an even more powerful engine and a sleeker look. Multiple models of the 700 were released through the years, including a base-model 700 in 2012 that came with lower-level preload-adjustable shocks. The 700R came with compression- and rebound-adjustable shocks, and Special Edition renditions had limited graphics and plastic colors, as well as GYTR parts. The Raptor’s 660 motor was used in the 2002 Yamaha Grizzly 660 a year after the sport quad’s release. Kawasaki’s overly heavy CVT-equipped KFX700 didn’t stand a chance against the Raptor in the end, and the Can-Am DS650 met the same fate. Honda took some time, but eventually released the TRX700XX to compete with the Raptor 700R. Unfortunately, Honda came into the game at the wrong time. In 2008 the economy tanked. Year after year we saw our beloved racing 450 quads and other sport quads dwindle as their model lineups fell out of the market. The sad truth was that not many could afford buying toys, so new sport quad development faded as well. Sometimes you can catch a Dirt Wheels editor wiping away a tear after recollecting memories of the good old days. 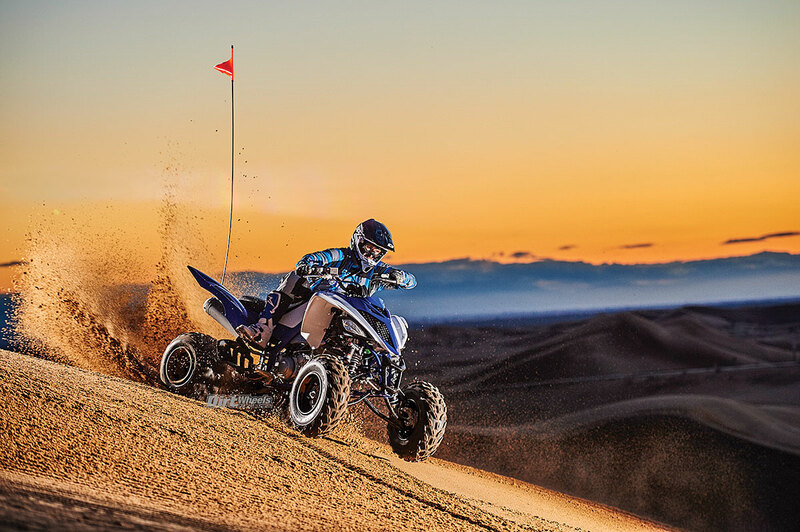 One place you can always find a Yamaha Raptor 660 or 700 lurking around is at the sand dunes. The torque monster is a perfect machine to carve the sand, and customization is common. Yamaha’s Raptors have enough power to shred any trail you put your mind to. They favor the dunes and the desert. 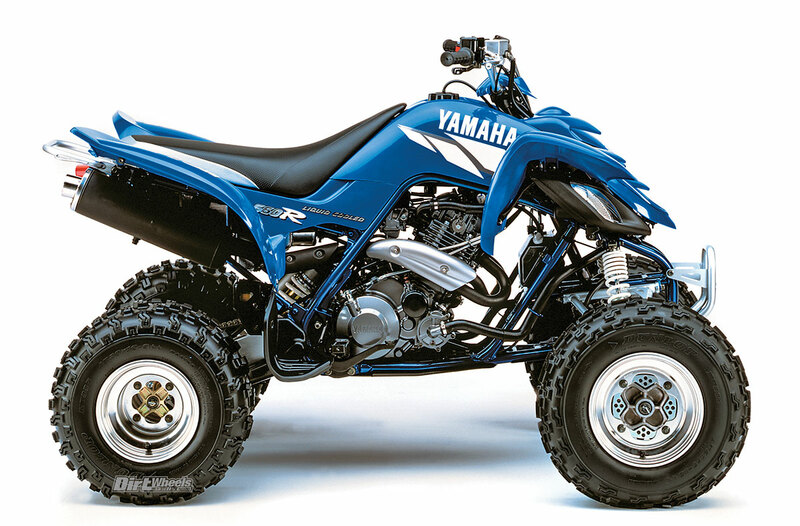 What we didn’t expect was that the infamous Yamaha Raptor 700 would become the best-selling ATV around. It fought through the rise and fall of our economy. The 700 outlived the two-stroke era and battled the sales of race-inspired sport 450 ATVs that boomed since their introduction in 2004. The Raptor 700 offered most of the performance of a 450, but with a reliable, long-lived engine with modest upkeep needs. There is no need to rev the guts out of it, even in the dunes. To this day, we get reader submissions of Raptors that have been upgraded or kept pristine through the years, and plenty of brand-new ones fill the pages in this magazine too. The Yamaha Raptor 700R is a force to be reckoned with! 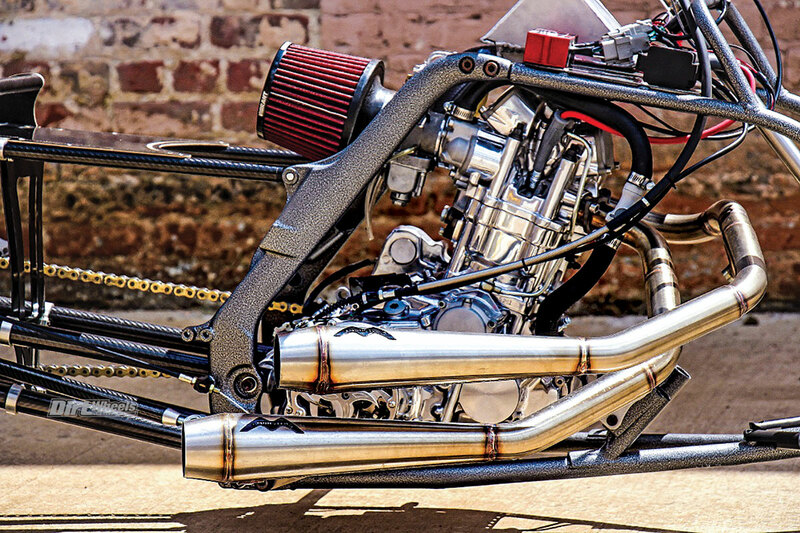 You can find the coolest custom builds on these machines by flipping through our “Over The Bars” section and our “Letters” section of the magazine. We found this one with a quick web search, and it is highly modified for running in the sand. Pulling power from a Raptor engine isn’t too difficult. This is a custom-built drag-racing Raptor with a ton of modifications to make the engine go as fast as it can. One of the best places to find Raptor masterpieces prowling for weaklings to defeat in straight-line supremacy is at the sand dunes. Stretch it, enhance the handling, beef up the engine and you will fit right into a tribe of fire-breathing warriors. We have covered or built customized Raptors with turbo kits, advanced suspension, big-bore kits and more over the years. The Raptor can be turned into your ultimate trail quad, sand-dune shredder, motocross track master or desert dueler. The amount of upgrading that can be done to this machine is almost endless, and we have seen our fair share of impressive, gas-guzzling, monster Raptors. If you have an awesome Yamaha Raptor 660 or 700, share it with us by sending photos of it with your full name, city and state, and some info on it to [email protected] Go to www.dirtwheelsmag.com to check out project Raptors, readers’ rides and info on the 2018 Yamaha Raptor 700 lineup as well!